Spain's Costa Dorada is packed with glorious beaches and vibrant resorts. Spanish culture is some of the most colourful and vibrant in Europe, and a visit to the Costa Dorada isn't complete without spending time in Barcelona. Those with an interest in art or architecture will love wandering the city’s colourful streets and parks. Whether it’s an energetic break or a relaxing time out that you’re craving, one of our Costa Dorada campsites should tick all of the boxes on your holiday check-list. PortAventura PortAventura is really several parks in one: including themed world zones, a water park, Europe’s tallest and fastest roller coasters in Europe and for younger visitors the magical SésamoAventura, inspired by the characters of Sesame Street. No fewer than three golf courses next to the park add to the attraction. An essential trip for family camping holidays in Spain. Barcelona Barcelona is an absolute must see, for its stunning architecture and wonderful cosmopolitan atmosphere. Enjoy the street entertainers on the famous Las Rambla, take a trip round the buildings of Gaudí’s Barcelona, and wander through the narrow and twisting streets in the Gothic quarter. There are lots of imaginative ways to see the city, including a Chocolate Tour, a Scooter Tour, a Running Tour and of course, a Tapas tour! If you visit the city for two consecutive days, get hold of a Barcelona Card and enjoy free public transport and lots of discounts when you’re shopping and sight-seeing. Tarragona Tarragona was one of Roman Spain’s most important cities, and briefly the capital of the Empire. Visit the amphitheatre and the Roman walls and discover a wealth of artifacts in the National Archaeological Museum, including the iconic Medusa’s head mosaic, before heading to the nearby Gallery of Modern Art. After a seafood lunch beside the harbour, explore the medieval old town–the Parte Alta– and the Cathedral of Santa Maria, built on the ruins of a Roman temple. 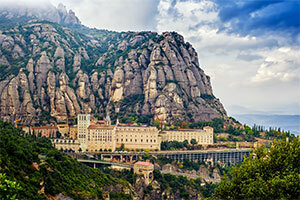 Montserrat Montserrat is one of the most important religious sites in Spain. The top of the mountain is reached by funicular railway and cable car, and offers spectacular views. A trail leads to the Holy Grotto, and the world-famous L'Escolania boy’s choir performs most days in the Basilica. The local Aromes de Montserrat liqueur is flavoured with lavender, juniper, spices and herbs. To find your perfect campsite in the Costa Dorada please use our interactive site finder, call our knowledgeable customer advice team on 01 242 1901, or go straight to the individual campsite pages.